An interesting collection of donated books in both Polish and English will be for sale similar to the Friends of Library book sale at public libraries. The Polish Home restaurant is open from 1 to 4 as is usual on Sundays. The Polish Hall in Portland presents Jerzy Kopczewski in a monodrama Jasnie Pan Jakub, based on a novel by Wieslaw Mysliwski. Mr. Kopczewski is a renowned actor from Vancouver, BC, and an alumnus of the legendary Piwnica pod Baranami cabaret in Cracow. He is also a co-founder of the Teatr Osobny Malych Form Jotka in Vancouver and this year he celebrates 50th anniversary of his artistic career. Where: at the Polish Hall & Library in Portland, OR; tickets $15 & $10, advanced tickets online or at Grandpa's Cafe in Portland. The book for the meeting is Ostatnie rozdanie by Wieslaw Mysliwski, published by Znak in 2012, as well as Ciemno, prawie noc by Joanna Bator (see the info posted with the February meeting). Mr. Mysliwski, a writer and playwright, was the first recipient of the prestigious Polish literary award, Nike in 1997, which he received for Widnokrag (The Horizon). He won again in 2006 with his Traktat o luskaniu fasoli (A Treatise on Shelling Beans). His books are on Amazon etc. The Polish Cultural Center presents Jerzy Kopczewski in a monodrama Dobrze ulozony based on the story Sposob zycia by Kazimierz Brandys. Mr. Kopczewski is a renowned actor from Vancouver, BC, and an alumnus of the legendary Piwnica pod Baranami cabaret in Cracow. He is also a co-founder of the Teatr Osobny Malych Form Jotka in Vancouver and this year celebrates 50th anniversary of his artistic career. Where: at the Polish Cultural Center Dom Polski; tickets $$25 at the door, $20 advanced, $15 students. Alisa Lahti invites again to her very popular workshops. Pisanki is a very old art of egg painting, where hot wax is drawn on an egg to create intricate patterns, the egg is then dyed wonderfully vibrant colors. Come learn this technique and take home some of your own beautiful Easter eggs! All materials provided. Where: at the artist's studio on March 22 & April 5 at 10 am to 2 pm; $25 per person. Please note: based on past experience class size is limited to 5 people, so make your reservations early. More: For reservations on any of these please contact alisalahti@live.com or call 206-499-5367. The Polish Hall in Portland presents pianist Igor Lipinski. Mr. Lipinski is one of the exciting Polish concert pianists of the young generation who has played in the USA as well as in Poland, France and other European countries. The recital program includes all Polish composers, some rarely heard, such as Stojowski, Godowski, Leszetycki & Friedman as well as compositions by Paderewski and Chopin. Where: at the Polish Hall & Library in Portland, OR; tickets & more info. 2014 Seattle Jewish Film Festival presents the movie Aftermath / Poklosie directed by Wladyslaw Pasikowski. The movie, set in contemporary Poland, tells a story of two brothers who face a backlash in their own village when they ask too many questions about fate of their Jewish neighbors in WWII. The movie won several awards and nominations in Poland but also created a controversy. In Polish with English subtitles. 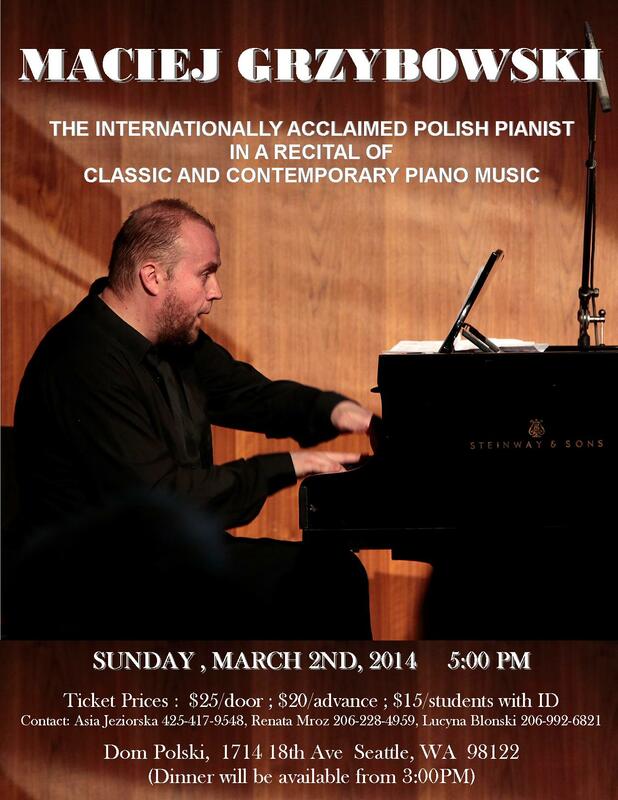 The Polish Home Association presents a concert by internationally acclaimed Polish pianist Maciej Grzybowski. This is the second visit of Mr. Grzybowski to Seattle - he also played at Cornish in 2012. His program at the Polish Home includes four sinfonias by Bach, Intermezzi by Schuman, Dwie etiudy by Pawel Szymanski, a mazurka by Paderewski, two preludes and two etudes by Rachmaninow and Polonaise in As-Major by Chopin. The restaurant will be open from 5:30 pm. The concert has been rescheduled due to winter storms in mid-west. The tickets bought for Sunday are good for the rescheduled concert on Tuesday. If you want to receive a refund please contact Marian Strutynski or call 425-746-3037 before the concert. Where: at the Polish Cultural Center Dom Polski; tickets $25 at the door, $20 advanced, $15 students. This is the 11th Anniversary Benefit Ball for Agnieszka Laska Dancers. Attractions include performances by Steven Adams - guitar, Tatiana Kolchanova - violin, Nancy Wood - soprano, Paul Safar - piano; Dance Party on large dance floor with live music by NEKKED BONZ (NBZ), MCs: Don Kern & Carla Grant from The Tuesday Group as welll as ALDancers in past and present excerpts, plus previews of new creations.